Universal City, CA, (July 1, 2014) -- Eight memorable films from one of the most acclaimed directors in motion-picture history come together for the first time ever in the Steven Spielberg Director's Collection , available on Blu-ray and DVD on October 14, 2014, from Universal Studios Home Entertainment. Since beginning his long and distinguished career on the Universal backlot more than 40 years ago, Spielberg has gone on to direct an unprecedented number of some of the biggest box office hits and critically-acclaimed films in cinematic history. The Steven Spielberg Director's Collection showcases some of the most unforgettable movies the three-time Academy Award winner made for Universal, including his debut film Duel which has been digitally remastered and restored and will be presented in widescreen for the very first time in the U.S. and Canada. From early achievements such as his very first television feature, Duel, and first theatrical release, The Sugarland Express, to blockbusters such as Jaws, E.T. The Extra-Terrestrial and Jurassic Park, Spielberg's films have captivated audiences worldwide and set a new standard for filmmaking. Starring some of Hollywood's top talents, including Drew Barrymore, Richard Dreyfuss, Julianne Moore, Holly Hunter, John Goodman, Dan Aykroyd, Jeff Goldblum, Sam Neill, Samuel L. Jackson, Laura Dern, Goldie Hawn, John Belushi, Vince Vaughn, and film icon Audrey Hepburn, the films included in this historic collection are accompanied by a Blu-ray exclusive: A 58-page companion book on the visionary director's career, featuring rare photos, archival materials and more. 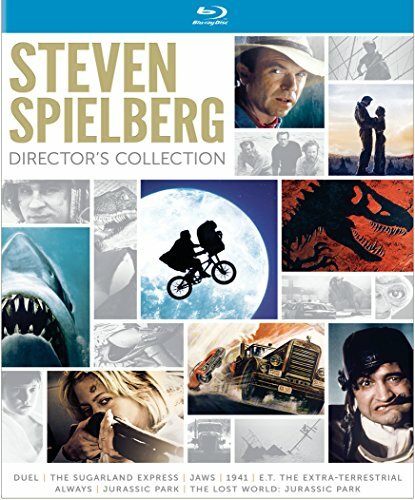 The Steven Spielberg Director's Collection includes four movies never before released on Blu-ray(TM) including Duel & The Sugarland Express that have been digitally remastered from their original film elements. Hours of bonus features include Making-of Documentaries, Interviews with Steven Spielberg, Behind-the-Scenes Featurettes, Rare Archival Footage, Deleted Scenes and much more. The perfect gift for any movie fan, the collection offers an opportunity at last to experience some of the most memorable films of our time from perhaps the most influential filmmaker of the past 40 years. A traveling salesman (Dennis Weaver) is terrorized by an unseen trucker on a remote desert highway. When a seaside community is under attack by a great white shark, the chief of police (Roy Scheider), a marine biologist (Richard Dreyfuss) and a shark hunter (Robert Shaw) embark on a quest to destroy the beast. Pandemonium erupts in Los Angeles after the WWII attack on Pearl Harbor in this wartime spoof starring Dan Aykroyd and John Belushi. After sacrificing himself to save a friend (John Goodman), a daredevil firefighting pilot (Richard Dreyfuss) returns to earth to help his surviving girlfriend (Holly Hunter) move on with the help of an angel (Audrey Hepburn).